The demands of discipleship are tough. Jesus demands we prefer Him above all relationships and carry our cross daily. Next, Jesus demands we count the cost of following Him, NOW, to ensure we are able to finish strong. I believe this step is basically ignored by most believers because they each instinctively believe they have what it takes to remain faithful to the end. This is simply self-deception or Jesus wouldn’t mention it. Remember, if Jesus mentions it… it is a problem. The Bible is chock-full of stories of people who didn’t finish strong. Even though they started great, they finished poorly. Somewhere in the course of their race, they put their spiritual life in cruise control and started coasting. When we coast, we become fodder for the enemy. A quasi-delusion sets in and we believe we can simply rest on old victories, old words… and even the words of other believers. Who of us could ever compete with Noah? His life story is the stuff of legends. Noah and his family were saved from the flood by God’s word, but poor Noah ended as a drunken man who got naked and cursed his son. Solomon was the wisest man in all of history, but he didn’t finish well either. He loved women and his many foreign wives turned his heart from God. King David and King Saul before him each had fatal flaws as well. Jesus presents a story about the importance of “counting the cost” so we each will finish what we started. The key to remaining hot-hearted for God is to stay in love with the Lord. You may stray some but your love for the Lord will ultimately keep you on track! If you count the cost now… you will not be tempted when some cheap substitute for true obedience comes your way. If you count the cost now, you will not sell-out to other loves and idols. We are to guard our love relationship with Jesus. 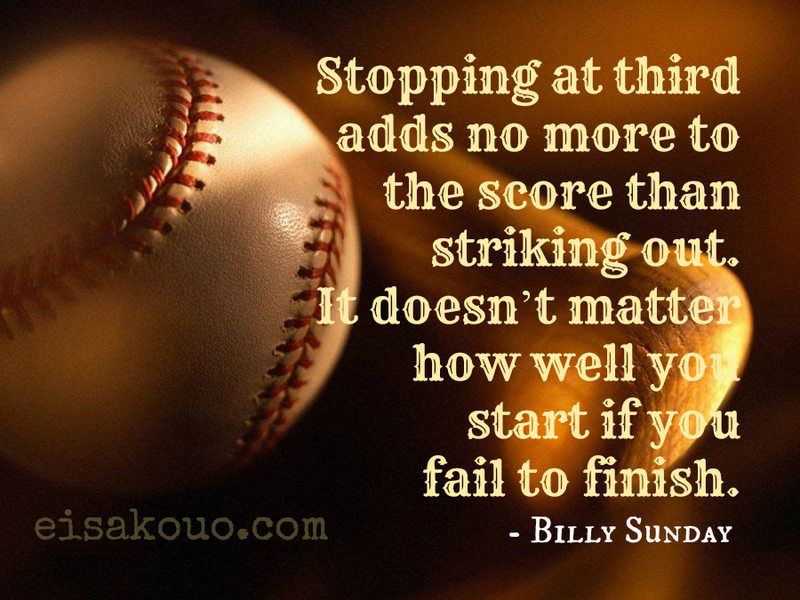 So ask yourself… Are you going to finish well? Do you so value what God is doing in your life that you would never drift or coast on your personal process? The good news is your race is not over. You can still finish strong and be more in love with the Lord by the end than when you started. It doesn’t matter what has happened in the past, you still can finish strong. The finish line is still ahead. “You fail to understand,” answered the seasoned old man, “because you failed to ask the obvious question. Why didn’t the other dogs continue on the chase? Listen, how we answer this question reveals whether we will pursue the Lord until the end. Have you seen and met with the Lord lately? Is His presence still burning in your heart? If you’re simply going through the motions because everyone else is and you know it is the right thing to do… you will eventually drop out. You must see Him!